As Haines tries to ingratiate himself with Stephen, Stephen thinks sullenly that the friendly overtures are motivated by guilt: "Speaking to me. They wash and tub and scrub. Agenbite of inwit. Conscience. Yet here's a spot." He reads into Haines’ solicitude about all things Irish a conscience desperate to atone for all the blood on English hands. Two different literary evocations of the gnawing action of conscience, one medieval and one early modern, inform his thoughts. Thornton traces the first allusion to a moral treatise compiled by a Dominican friar named Lorens under the title Somme des Vices et Vertus (1279) and translated into Kentish Middle English by Dan Michel of Northgate as Ayenbite of Inwyt (1340). The English title means "again-biting of in-wit," powerfully suggesting a mind (“wyt”) turned in upon itself, biting the offender with bad conscience again and again (“ayen”). Shakespeare’s Macbeth dramatically represents the same thing, showing how the murderers’ minds torture them with guilty hallucinations about the acts they have committed. Macbeth is visited at a dinner party by Banquo's ghost. Lady Macbeth scrubs her hands as she walks in her sleep, trying to erase the “spots” of Duncan’s blood (5.1.31, 35). Both comment poignantly on what their thoughts are doing to them: “Yet who would have thought the old man to have had so much blood in him?” (5.1.39-40); “O, full of scorpions is my mind, dear wife!” (3.2.36). 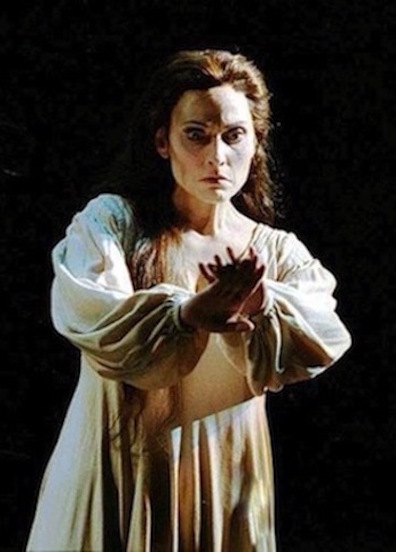 Lady Macbeth, in an unknown performance. Source: macbethmuskanaulakh.weebly.com.